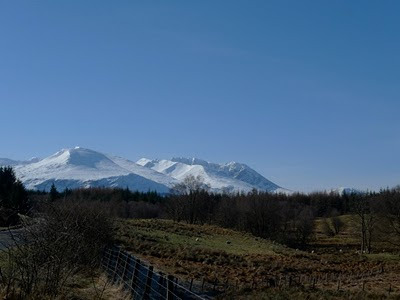 Ben Nevis, Good Friday morning! First, wild snow storms with scary bangs and clatters outside in the blizzard all night, then glorious roasting hot sun. More of this please! 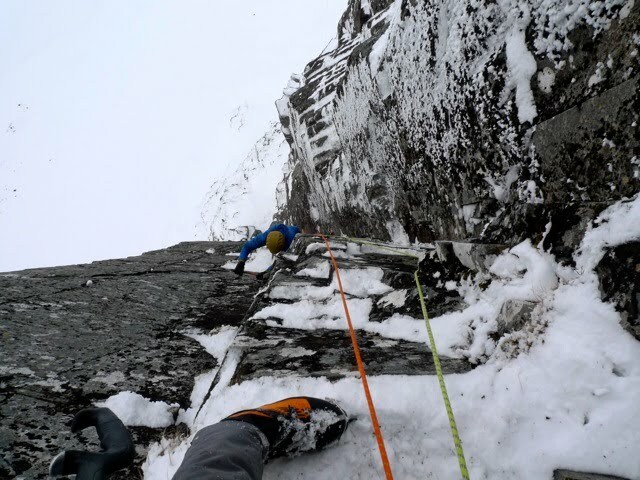 Yesterday Donald and I trudged into Stob Coire nan Lochan to look at a hard overhanging new line. 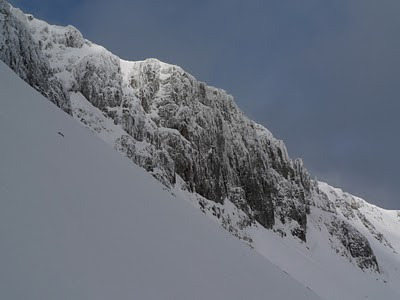 But after an hour or so probing about overhanging blankness I could see I was extremely unlikely to gain any more height, so we scooted across the Coire for a fairly chilled ascent of Unicorn. As I brought Donald up the first pitch, a 10 minute glimmer of spring sunshine was enough to start the rime falling from above us. I climbed the third pitch to the big ledges but and we abseiled down, both talking about the end of the winter feeling near and talking about rock climbing objectives for the coming months. Unicorn looking in fine condition before the afternoon sun got going! This morning I was off to the cave to meet Pete and John for sessions in the steepness. The morning started off dousing my car in antifreeze to free it from the grip of the deep morning frost. But arriving at the cave it couldn’t have been more different, and the sunbathing:bouldering ratio approached 1:1. Got the long link project ‘in two’ though and I’ll be going in for the kill on this next week no doubt. For a couple of brief moments today I felt like I was remembering how to climb rock. On the way back through Glenfinnan I took a detour to have a dangle about on a hard slab project Donald had tipped me off about. The moves were done on this. But a lead might take a bit of soul searching for me. 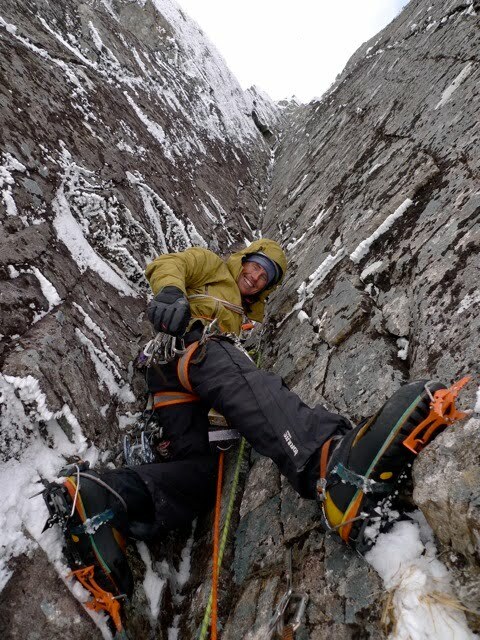 A very tenuous and committing crux about 35 foot above a tussocky landing. Either a very serious E8 7a or could be edging into E9. Cant imagine it right now, but perhaps after some more focused work it’ll feel more possible.